What is Data Acquisition, Anyway? Do you really know what a data acquisition system is, or do you just have sort of a fuzzy picture that you think of when you hear the words? Even if somebody gave you a good, workable definition of a data acquisition system sometime in the past, does it still fit the data acquisition technology of today? We need to start this book off by drawing a Venn diagram and identify what belongs in and what belongs out. We have to start out with a sharp, clear borderline , even if we intend to be a little flexible about applying it. We need a clear starting pointsomething to refer back to when you have to make those tough decisions. Otherwise, if you start out fuzzy, you can get lost really fast. So, what is a data acquisition system and, more importantly, what is not? I think we can identify a data acquisition system by what it does more readily (or at least more reliably) than by what it is. What a data acquisition system is can change dramatically with technological advances. What it does is likely to be more stable. What a data acquisition system does is capture information about a real-world physical (as opposed to, say, financial) system and archive that data in a form that is readily available for scientific or engineering analysis. I think we should also require the data acquisition system to do that job automaticallywithout real-time human guidance. The next question, if you buy my definition of what a data acquisition system does, is: "What elements do we expect to find in a data acquisition system?" Figure 1.1 shows a conceptual block diagram that includes all the main functions of a data acquisition system. Figure 1.1: A data acquisition system includes elements to perform seven essential functions. Obviously, if youre going to capture information about a real-world physical system, youd better have some sensors out there that measure things about the physical system and convert them to data signals. These signals can come off the sensors as either analog or digital signals, but theyd sure better be in some form that can travel from the sensors to a central location where they can be collected, sorted, cataloged and stored. That travelling, collecting, sorting, cataloging and storing doesnt have to happen in real time, though. You arent going to look at that data in real time. What youre going to do with it is analyze it after the fact, anyway. If you tried to analyze it in real time, youd end up with an incomplete picture of the experiment and youd probably interfere with the more time-critical job of capturing the next piece of data. Although microprocessors think fast enough that they seem able to do more than one thing at a time, thats really an illusion. One processor can do only one thing at one time. If your processor is off doing a trend analysis of the data-set-so-far when the time comes to grab the next data point, it will miss that next data point. The travelling has to happen along some kind of data-transmission link. This link can be as simple as a couple of wires leading from a thermocouple, or as complex as the Internet. The third element is a means of collecting the information into a data stream. That is usually accomplished by a data-acquisition board, but there are other possibilities as well. The point is that the "collector" takes multiple analog and/or digital signals from sensors and puts them out as a digital data stream (usually) on a computer bus. The sorting, cataloging and storing happens in a general-purpose computer. By the way, an embedded controller is just a general-purpose computer with blinders on so that it has fewer distractions than, say, a desktop PC. In order to do its sorting and cataloging, however, the computer needs a little added information about the data. Just knowing that a thermocouple reported a temperature of 625.7° C doesnt do the job. When that measurement was made is probably the most useful thing to know about it, so youd expect to see a reliable real-time clock providing time tags for the data points. What else is going on in the physical system at the time the reading was taken is also important. So, the data acquisition system has to have some kind of event triggering. In many systems, the computer actually controls the physical system, so control outputs are a common feature. Finally, what we need to have in the end is a permanent record of all this information that the data acquisition system collected. In the end, it goes into data files stored on some kind of (usually) magnetic media, such as floppy disks or magnetic tape. So, as Figure 1.2 shows, the elements we expect to see in a data acquisition systemwhat the data acquisition system isinclude sensors, data transmission links, a collecting means (such as a data acquisition board), a processor, a clock, triggering and/or control hardware and a means of laying down a permanent electronic record. 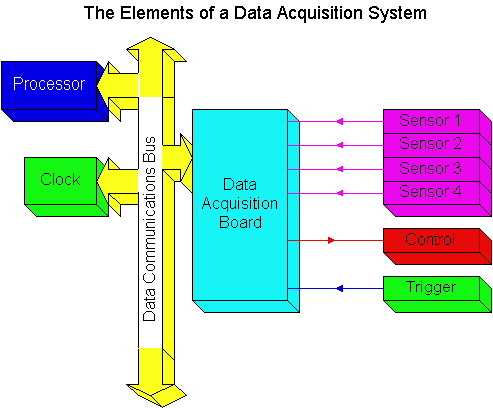 Figure 1.2: Venn diagram showing what constitutes a data acquisition system, and what doesnt. 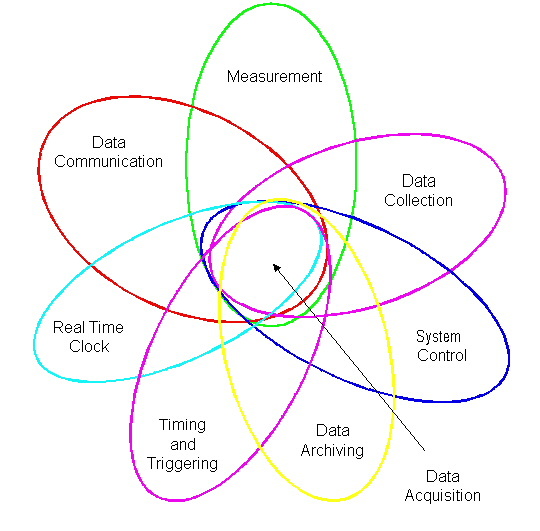 If you run across a thing that has these seven elements, its a data acquisition system. If it has some, but not all, of them, it could be a component of a data acquisition system. If it has these elements and more, then it is a bigger system of which a data acquisition system is a part.